A month ago, we polled our readers asking them if their Google AdSense earnings were up, down or the same. We had about 300 responses come in and most of those who responded said their earnings are down historically. 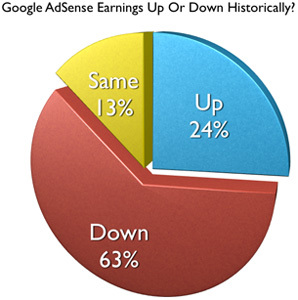 The question we asked was are your Google AdSense Earnings Up Or Down Historically? Over 62% said "My Earnings Are Down"
About 13% said "My Earnings Are the Same"
About 24% said "My Earnings Are Up"